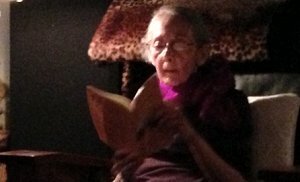 My mother of 83 who lives with us spent a couple weeks in the hospital recently, where she was undergoing the 100,000-mile tune-up for her Parkinson’s disease, which she has been living with for the past ten years. I have learned a lot about this disease in this time. Her Parkinson’s is very advanced so she has minimal motor control, and almost zero mobility. She can’t swallow, can’t talk and can barely walk – even with someone helping her. As is common with advanced Parkinson’s disease sufferers, they have good days when things seem to be working well, and they have bad days when the effects of Parkinson’s kicks in. One day I called the hospital to speak with Maria, my mom’s caregiver, who doesn’t speak very good English. It was a bad day for mom. When I asked Maria what my mom was doing, her answer was, “She’s parking”. I was confused, as my mom can barely walk, and hasn’t driven a car in years. It turned out that “Parking” was what Maria thought the Doctors were saying, when they described her as having Parkinson’s. So now, on mom’s bad days, our family says that mom is parking. 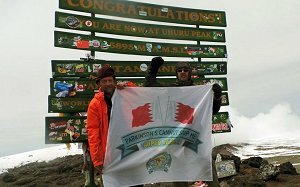 On my most recent Kilimanjaro climb, one of our climbing team members was a guy named Ahmed Jaafar, who hailed from Bahrain in the Persian Gulf. Ahmed is a highly driven, very successful 57 year old businessman. We spent many hours on the Kilimanjaro trail chewing the fat and became fast friends. Ahmed also had a sense of humor that kept us in stitches as we sat around the mess tent. But, as it turned out Ahmed was “parking.” He had been diagnosed with Parkinson’s disease about 3 years ago. After recovering from the shock of the discovery, he decided that he was not going to surrender to the disease. And so he embarked on his new life journey – pursuing real adventure to prove that Parkinson’s was not going to stop him. 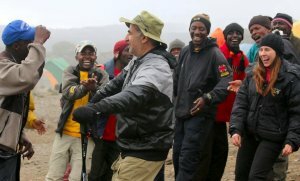 Ahmed successfully summited Kilimanjaro with the rest of the group, in spite of his “parking.” In July this year, he will be joining Tusker’s exhilarating Trek in Mongolia. So, here’s what’s so strange to me. 1. Ahmed’s “parking” is a result of his brain producing an insufficient amount of dopamine. Yet, paradoxically, he is driven to take risks which he has never attempted in his life before, such as starting the largest supermarket chain in Bahrain, climbing Kilimanjaro and riding a horse on an 11-day expedition in Mongolia. 2. My mother, whose “parking” condition is also a result of her brain not producing enough dopamine, took a huge risk when she acted in an underground anti-government film during the oppressive apartheid years of South Africa. And she gave birth to an individual who has spent his entire life seeking out thrills and adventure. Am I to deduce that my drive for adventure is thriving off of my mom’s dopamine which she bequeathed to me in some bizarre neurotransmitting moment? And that’s why I’ve got plenty and she does none? Who knows? The irony is not lost on me. What I do know is that the ebb and flow of dopamine has created a welcome intimacy with my wordless mom, and has also introduced me to my new friend, Ahmed.